[Blind Gossip] This very famous actor usually plays a tough guy on screen but is quite affable in real life. He’s got a good life. He’s healthy, he’s still working, and he’s rich. His last wife was an actress. His current wife has given him some beautiful children, and their marriage is fine. When we heard he was recently talking about having another baby, we were puzzled, because he’s definitely middle-aged and it seems like he already has a lot of kids. He talked about how much fun it would be to have a little boy to play ball with and take to sporting events, and that his wife is on board with the idea. Perhaps he isn’t thrilled about the amount of estrogen in his household? [Optional] Is there an age at which you think men are too old to be a new father? Actor Bruce Willis and his wife are trying for a baby boy! He’s an on-screen tough guy, but in real life, 60-year-old Bruce Willis is a regular family man. He had three girls with his former wife, actress Demi Moore, and he has two young daughters with wife Emma Heming. See pics below. Bruce Willis Turns To Science To Have A Son! Bruce Willis and second wife Emma Heming are turning to IVF technology to assure that, after five daughters, his next child will be a son! “They’ve been consulting with fertility experts to increase their chances of conceiving a boy,” dished a source. Bruce, 60, has three grown daughters from his union to actress Demi Moore: “Dancing With the Stars” winner Rumer, 27, Scout, 24, and 22-year-old Tallulah. He also has two young girls with British model and actress Emma, 37, named Mabel, who’s 3, and 20-month-old Evelyn. “Bruce is beyond excited,” dished a longtime pal of the “Die Hard” actor. “He has always wanted a son. This time, they’ve decided they aren’t going to leave anything to chance. Congratulations to Sabrina325 for being first with the correct answer. By the way, you all had some interesting comments about how old is too old to be a new dad! It has to be Bruce Willis. Note the clue about the second wife giving him “beautiful children”. Unfortunately, you cannot say the same about the first! I literally laughed out loud on your response! I had to look them up, I totally don’t get why they’re not beautiful that combination should produce beautiful children. Rob Lowes I get but that is not on that gorgeous Rob. I think everyone missed out on the chilling part of this. IVF to “increase odds of a son”? You know what that means… IVF usually means implanting a couple of embryos when someone cannot conceive but CAN carry a pregnancy. often not all take but occasionally they do hence the increased chance of twins (helllooooo angelina jolie). but what you DONT do is try to select by gender. There is a medical ethics things going on here. im sure doctor not happy story is out if trye. There is no ethics issue. It’s called spinning the sperm and it’s been done for years. Of course, by using Toni Weschler’s method you can be about 90% sure, but if you’re rich enough I don’t see a problem with only implanting male embryos. Sperm sample sorting by centrifuge ( X sperm weigh more than Y sperm) has been used in IVF for about 30 years. Gender selection is illegal in the UK. The only exception is if the family carries an illness that only effects one gender, say girls, then they allow them to select a boy to avoid the illness. The same applies if the mother cannot carry a certain gender full term. Apart from those exceptions, it is considered unethical, as you are placing more value on one gender over the other. This has to be Bruce Willis and his five girls- three from ex Demi Moore and two with his current spouse. Optional: is this because of his little girl choosing boy clothes? Brad Pitt has 3 sons (Maddox, Pax and Knox) in addition to 3 daughters (Zahara, Shiloh and Vivienne). This – the fist is a Rocky clue (boxing). I am 47 and would love to adopt again. Some parents can be around for 60 years and make every day hellish. Others can be there for a decade and make each day amazing. In some ways older parents can be better for children – and children can be great for older parents. 50! Sly Stallone is almost 70! Def not him!! I thought this as well, but he has 2 sons with his first marriage. I think one is handicapped and the other just passed away. Sad for Sylvester and his family. If he does, more power to him and his wife Jennifer. He had a son, who tragically passed away a few years ago. Has 3 daughters with Demi Moore and 2 more with his current wife. matt damon, is 45 middle aged these days? Since men in the US rarely live to be 90, if anything it’s past middle aged! He has only been married once. Sadly, I wish I didn’t know this– but Matty D is hard NOT to notice. Sylvestor Stallone. He had one son who died very young. He has 3 daughters. Considering he is 69 years old, he’s crazy to be fathering a child that he may not even see grow to be a teenager. However, it’s his life and he and his wife should do what makes sense to them. Stallone had a son name Sage who died at 36 of a heart attack. It happened just a couple years back. I believe there’s also an adult autistic son named Sergeough, also from his first marriage. Bruce Willis…as long as he’s wants to be a father, go for it. 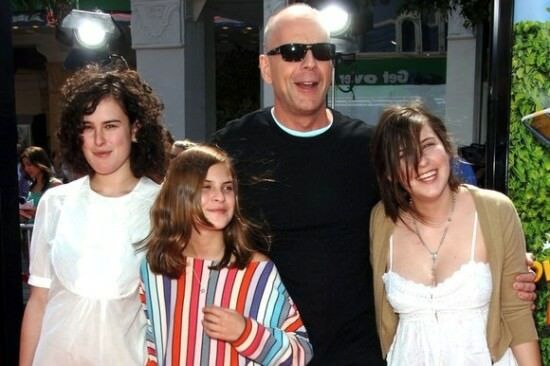 Bruce Willis has five daughters. Optional: Although I do think there’s an age when men just need to stop spreading their seed, there are some very happy children with very old fathers. Isn’t that why guys in their 50s keep marrying girls in their 20s — to keep breeding? I first thought of Matt Damon since he has about 4 daughters I think but he hasn’t been married before, so….. Brad Pitt? Thought he already had a son, though. Bruce Willis–was going to guess Sylvester Stallone (married to his first wife Sasha, then actress Brigitte Nielsen, now Jennifer Flavin) but he already has a son, Sage. Bruce Willis has only girls so far, and was previously married to Demi Moore. I think there does come a point where it’s irresponsible to bring a child into the world when you know you probably won’t be around long enough to see them grown, but then, there are no guarantees for anyone in life. You can have kids in your 20s and die unexpectedly in your 30s. If he feels something is missing in his life, go for it, Bruce. Stallone? Wasn’t Sage his only son? I can imagine he is feeling some grief still and misses having a son. maybe it’s weird, but Sylvester Stallone was my first guess. he’s almost 70. An adoption? Scratch that, Bruce Willis, 5 daughters. Bruce Willis. He has three daughters with ex-wife Demi Moore and two daughters with his current wife Emma. Actor: Bruce Willis. Three girls with Demi Moore and two girls with current wife Emma Heming. 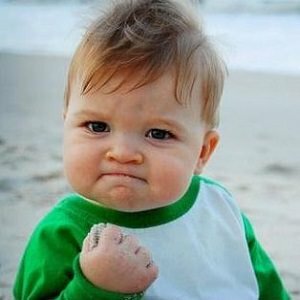 [Optional]: If Dad will be absent for the majority of the child’s life, yeah – best to call it a day in the baby making department. Once you creed over the 60+ bracket, would they be significant presence in their child’s life? Kid is 20 and Dad is over 80. I really hope this isn’t him. He has a son who is Autistic , who it seems he never acknowledges.and his eldest son died. This would be in really bad taste. I found it sad that he didn’t acknowledge his sons or his first wife in his speech anyway. Stallone is delusional at 70 to want another baby. 2nd guess. 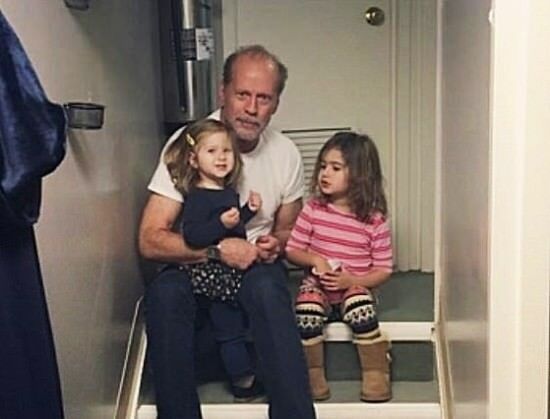 Bruce Willis but you would have stated he had girls or kids from first/previous wife. After 50 is too old. Anthony Quinn was in his 80s when he had a kid. Way too old. Not fair to the child. Bruce Willis. He has three grown daughters and a new baby girl. Obviously he wants a boy. Optional: Men have the opportunity to wait as long as they want to have their first child, but it’s unfair to deny the child the opportunity to have their father at a high school and college graduation or their wedding. Jeff Goldblum and Billy Joel are perfect examples but thankfully Billy is not a first time dad. Oops. I meant 3 girls with Demi plus 2 with current wife. I was gong to say Sly Stallone but he waaay past middle aged. Actor: Bruce Willis? He has five daughters, three by Demi Moore and two by his current wife. Sylvester Stallone – has 3 daughters. Adoption or surrogacy would be an option, but I don’t think it would be safe for his wife to have another baby. Obviously Bruce Willis. He must blow pink sperm with his five daughters.